This is the final update to DJ. Boy it's come round fast! Confirmed Red Dwarf stars attending are *Craig Charles, Chris Barrie, Danny John-Jules, Hattie Hayridge, Richard O'Callaghan and Robert Llewellyn. Oh and not forgetting the FX boys! *But this may not be the final list. Everyone likes surprises! Let me just check to see you have everything! (Please note no tickets are sent to you, see below for details) Arrival by car? By train? This is even easier! All you have to do is leave Birmingham New Street station by the Victoria Square exit, turn left, walk 25 meters, turn left again. The hotel is less than a 100 meters on the right hand side. If you're coming in at Birmingham Moor Street the route is just as easy; Come out of the station, walk straight across the road (don't forget to look both ways! ), under the bridge, follow the road round (you'll pass New St. Station on your right and further down a Subway sandwich shop) keep going down the hill until you reach the crossroads and turn right. You're there! The Holiday Inn is on your left. By Plane? Again this is easy as Birmingham International Airport is 20 minutes away by train to Birmingham New Street. Follow the above directions and you're there! You're at the hotel! OK what next? Check into your room. If you've previously booked your room with Holiday Inn, you'll know that it's a quick and easy transaction. Other hotels may have a different procedure so you should check with them directly if you have any concerns, but basically they're all the same. You've chilled out, stolen the shower curtain... what next? First step is registration. The registrations desk will open in the afternoon on the Friday, don't worry if you're chilling in the bar we'll make sure that you know when it's time. This years Dimension Jump is the second biggest ever, with over 350 attendees, as such we will be keeping the registrations desk open right up until the start of the events at 7pm. But don't worry if you're running late, someone will be available to registrations all night. When you register a fan club team member will take your name, assign you a number and provide you with your DJ pack. It will consist of the DJ booklet, a timetable of events and places where you can get your autographs, tickets for the autograph sessions, a feedback form so you can let us know what you think, entry forms for the Red Dwarf Olympics and last but not least your badge identification, this is your ticket to the whole weekend and must be worn at all times. If you have any questions regarding the event please contact a member of the Fan Club team, we will be around the convention all weekend and easy indefinable by our trademark tee shirts! We are always happy to help. I hope you enjoy the fantastic voyage that Dimension Jump provides! With the 15th Dimension Jump drawing inexorably closer, we are delighted to be able to confirm the addition of Richard O'Callaghan to the guest roster. You will all know Richard through his role as The Creator in Back to Earth , but he was also cast as a character called Hogie the Roguey during the early development stages of the sadly ill-fated Red Dwarf: The Movie . On top of his recent Dwarf connections Richard is a veteran in both TV and film, with a career spanning back to the 60s. We are very proud to welcome such a distinguished and well loved actor to what is turning out to be the biggest DJ in almost a decade. Keep your eyes peeled for more guest announcements in the coming weeks, as we start building momentum towards the most important weekend in any Dwarfers calendar. The 15th Dimension Jump is looming on the horizon and no doubt you'll be starting to gear up for what always has been and will be the best Red Dwarf weekend around. Registrations to date have been excellent and have ensured that year's DJ will be at least the most well attended convention since DJ 2000. At the start of June the Fan Club team packed their bags and headed off to Birmingham to have a spend a night in this year's DJ hotel, The Birmingham City Holiday Inn, meet with the events organiser and generally get a feel for the venue. We all came back with very positive thoughts, so allow us now to share those thoughts with you and hopefully furnish you with some key pieces of information to help you plan and begin looking forward to Dimension Jump XV. Don't forget, also, that the hotel itself provides a good summary of useful information on their site. 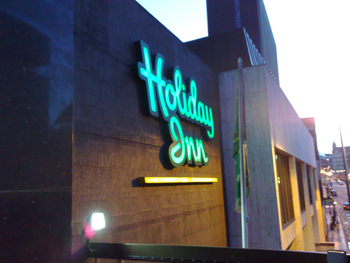 DJ veterans will know that the past three events have been held in Peterborough's Holiday Inn. 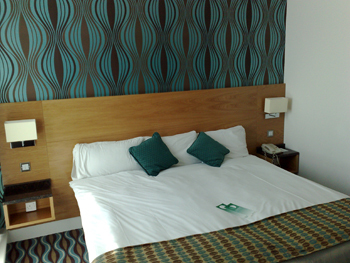 While its rural charms are undeniable, it was felt that this year the convention would be better served by a more central location and you certainly can't get more central than Birmingham City Centre and its lovely Holiday Inn. The decision to move to convention was made with everyone's best interests in mind, and it was felt that this location would be perfect to provide attendees and guests alike with the greatest convenience. 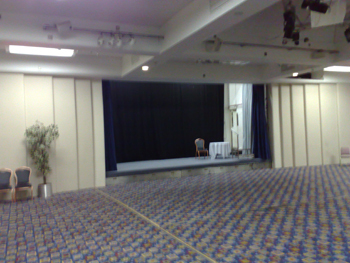 The main convention hall is a very large area, quite similar to conventions of the past but... well, bigger. Not only that, but it's stocked to the gills with audio/visual equipment that nearly brought Liam to tears to joy. With professional stage lighting, your pictures and videos will've never looked so good! An extensive refurbishment is currently ongoing within the hotel and at the time of our visit the rooms had all been newly fitted to a very high standard. From your room you can expect an excellent size, a flat screen TV and a personal safe among other things. Take a peek at the hotel site for a full list and pictures. The main event room itself is getting a bit of a spruce up over the summer, which will ensure by far the best equipped event room DJ has ever known. I think this one deserves its own bullet point, especially considering your average Red Dwarf fan and his or her basic needs: the entire hotel offers free and very speedy WiFi access to the Internet. Ahhhhh. The hotel bar is spacious, well furnished and located right next to the restaurant area. For those of you who enjoy a bit of fresh air (or a crafty cigarette) the bar also leads out onto a large balcony area for all your outdoors based relaxing needs. While we're here we should clarify a few details about the availability of hotel rooms. Some people have been reporting that they've been informed the hotel is fully booked. This is not the case and we will inform you all the second all our allocated rooms have been taken. The 'Step Two' page of this site contains all the information you will need to ensure a smooth booking, so be sure you use the numbers provided there or the online form specially setup for Dimension Jump attendees. Finally, always state that you are booking for the Red Dwarf Convention as otherwise they will not know that you can book one of the blocked off rooms. The hotel will be offering a varied and competitive menu to keep you well fed. We'll be providing you with the menus closer to the event once everything has been finalised but the options will include a reasonably priced buffet and restaurant service. For those of you hankering for non-hotel based options, welcome to yet another benefit of our new location. Just minutes outside the hotel doors you can access all the advantages of the city, including the Bullring Shopping Centre and a plethora of food establishments. One of the main reasons Birmingham and this particular hotel was chosen was for the ease of access. If you are arriving by train the hotel is quick and easy to get to. New Street and Moor Street stations are only a few minutes' walk away. Snow Hill station is the farthest away at a still favourable 0.8 miles. If you're flying into Birmingham for the convention, the airport offers a quick link into Birmingham New Street. If you will be travelling by car, the locations provides a number of parking options. The hotel provides its own secure parking service for £14.00 per day, plus there is a number of NCP run alternatives very near to the hotel charging similar prices. You can see a map of nearby parking facilities here or take a look at the NCP site for a up-to-date guide on pricing and locations of their car parks. And so ends the introduction to the Dimension Jump XV hotel. I hope this has furnished you with some useful and reassuring information and that you have a enjoyable time when the weekend rolls round. Keep an eye out here for further updates closer to the time as we update the attendees list and provide more information as we receive it.